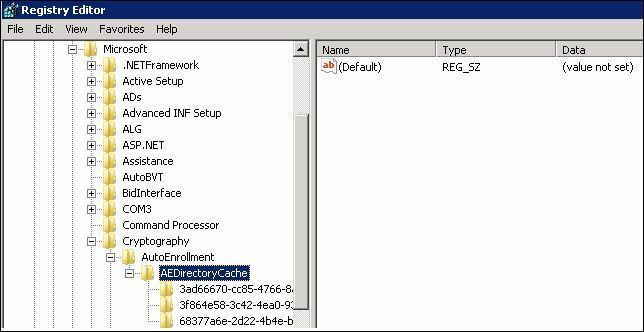 After installing a new Microsoft Certificate Server, the Event Logs on the Server 2003 domain controllers displayed an Autoenrollment error, Event ID 13 (Access is Denied) while on the 2008 domain controllers, an Event ID 13 error with the Source CertificateServicesClient-Request….or something close. 2. Please add the “Domain Users”, “Domain Computers”, “Domain Controllers” groups to the new CERTSVC_DCOM_ACCESS security group. Thinking I had my problem fixed, I wanted the DCs to attempt an autoenrollment once again, however, in my impatience, I didn’t want to wait for this to happen. Shortly thereafter, I reviewed the Event Logs on the DCs and they stated certificate autoenrollment was successful at which point I opened the Certificate Authority MMC on the CA and saw that certificates had indeed been issued. running “certutil.exe -pulse” from a 2008 DC triggers Autoenrollemnt too. (You are the second Dave Ball I've known). the Everyone Group was added to the CERT_SVC_ACCESS group by default. This is what we found when we came looking. Did you not have that in your group?